Labeling products by hand can be a suitable process for small applications. However, as a business grows and the packaging demands increase, automation can make a big impact on your efficiency and become a valuable investment. I recently met with Mike Soloway to discuss the benefits of automating the label application process. Check out this video we shot where Mike breaks down his top four benefits of labeling automation or read the list below. Labor is expensive, but with automation, you can free up your employees to be productive in other ways. An investment up front will create long-term savings in labor costs because these systems last for years. A quality system that is designed properly for your application last for many years and help you grow your business and meet the demands of your customers without needing to increase your workforce just for labeling. With manual label application, higher throughput results in more labels and less consistency in label placement. When an operator has to peel a label off a liner and then apply that label to a product, it's not an exact science. The label will often be crooked or wrinkled, and the faster they have to move, the more inconsistent the label becomes. This can lead to poor shelf appeal, barcode damage or even result in the label tearing or coming off the package. Automation allows you to keep your label placement on target, even when throughput increases. 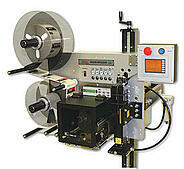 As your workflow increases, your label applicator can speed up with the demand. If you're hand applying and you have an increased demand for your product, you'll need to invest in more labor or even take people away from other productive projects. Verification options can make sure the right label was applied to the right product. Scanners and imagers can make sure that the barcodes and text are legible. With hand-applications you're more likely to encounter human error issues with labeling. There are two types of label automation: Primary and Print-Apply. Primary label automation is the process of applying fully pre-printed labels directly to products, virtually any size and shape. From food products like jelly jars, bakery clamshell containers or wine bottles, to health and beauty products like shampoo and lotions, to anything else that needs a label. You'll find benefits to label automation with almost all primary packaging applications. Print-apply adds variable printing to the label before it applies the label to the product. The most common use of print-apply is to apply labels to corrugated cartons with variably printed shipping labels. Other uses can include printing ingredients and nutritional facts on labels that are applied to food products. You'll also find print-apply applications that add warnings to chemical containers or serial numbers on labels that are applied to appliances or circuit boards. In both applications you could label by hand. But imagine how much time, money, and productivity you'll gain by investing in an accurate label automation system. To learn more about getting started with automation, or upgrading your current labeling systems, speak with a Weber Label Expert.